What is the ultimate panning clamp? While there are not many panning clamps to choose from, the Really Right Stuff PC-LR Round Panning Clamp is exceptionally well-designed and exceptionally well-built. It is worthy of being called "the best" in even a crowded market. What are the benefits of a panning clamp? Why would you want a panning? 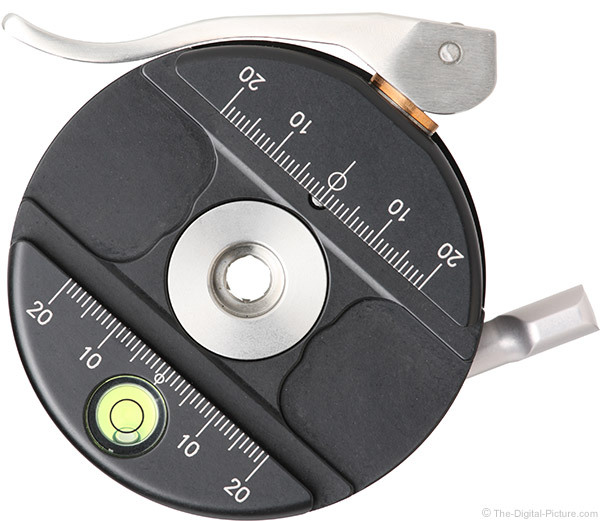 A panning clamp is typically installed on a ball head, either directly to the ball neck or locked into an existing clamp, adding a 360° rotating axis that can be locked in any position, and of course, a clamp for attaching a camera, lens or any other plate-equipped accessory. Ball head clamps can be leveled very quickly and easily and a panning clamp on a leveled ball head permits uncomplicated, perfect horizontal panning. That levelness is frequently desired for single row panorama image capture with an RRS MPR-CL II rail (included in the RRS Pano Elements Package) often being used to shift the rotation axis precisely over the lens' nodal point. Video recording often involves level panning and that is another good application for a panning clamp. While these are perhaps the most frequently used panning clamp applications, only your imagination can limit the uses for this clamp. Basically, with a panning clamp in the kit, a rotating axis can be inserted between any clamp and plate. Also, using the central 3/8"-16 threaded socket in the base, the two 1/4"-20 threaded sockets spaced at 55mm (2.2") or one of the included cap-head screws (1/4"-20 x 1.25" and M6-1.0 x 40mm screws), the panning base can be attached to a wide variety of supports and used for practically any application. If it needs to rotate, put a panning clamp under it. Should I get a ball head with a panning clamp? If you intend to use that feature a lot, definitely get a ball head with a panning clamp. 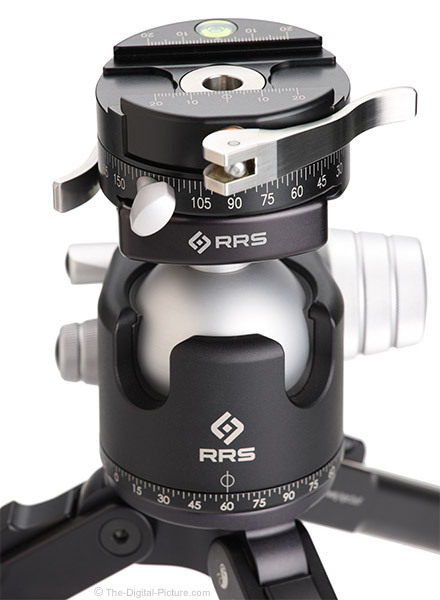 The Really Right Stuff BH-55 Ball Head with Lever-Release Panning Clamp includes the PC-LR Round Panning Clamp for an exceptional combination. Otherwise, the panning clamp adds weight, size, cost and a slight complexity to your head. If you only sometimes want a panning clamp, the product being reviewed here is what you want. 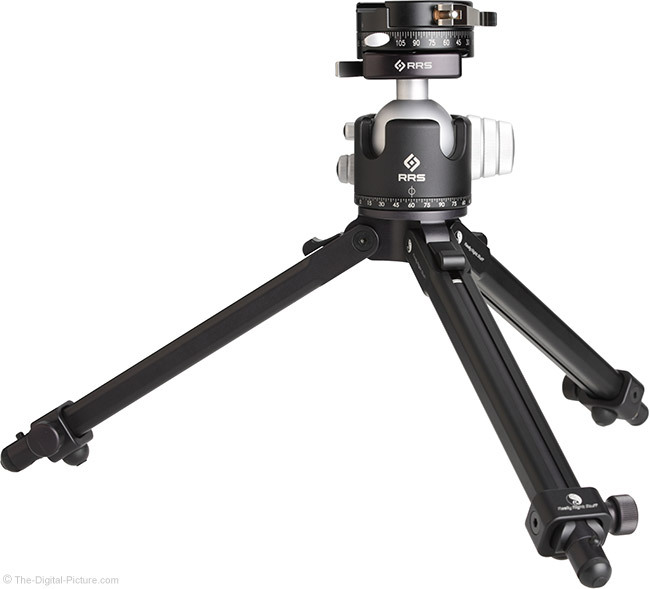 The Really Right Stuff PC-LR Round Panning Clamp drops right into your tripod head's Arca-Swiss-compatible clamp via the low-profile dovetail adapter built into the base. Install the panning clamp only when you expect to need that feature. Leave it at home or in your pack when not using it. Did you already purchase a head and later decided you really wanted a panning clamp? 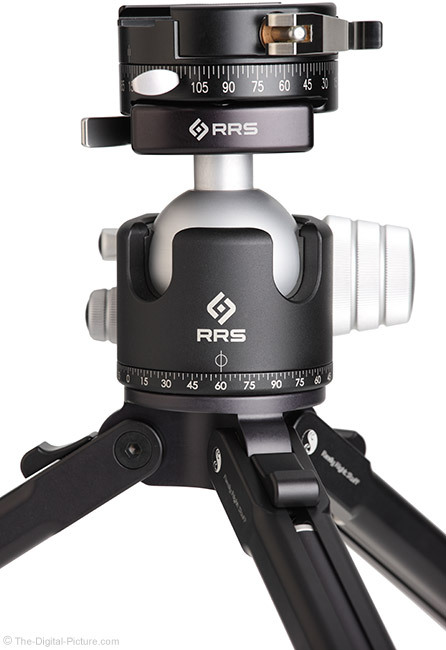 The Really Right Stuff PC-LR Round Panning Clamp will provide what you are missing and, via the provided cap-head screws, can replace the clamp on many ball head models. That capability opens many options, including replacing an inferior performing clamp. 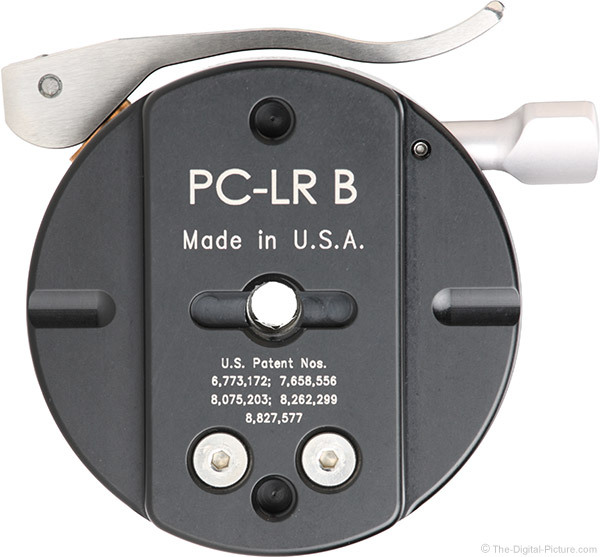 What makes the Really Right Stuff PC-LR Round Panning Clamp Great? Excellent design in conjunction with precision construction using high quality materials make the Really Right Stuff PC-LR simply an exceptional product. Starting at the bottom, the 360° rotating base, machined from solid aircraft aluminum, is laser-engraved in 2.5° increments with index marks provided on three sides of the rotating clamp (the lever release obstructs the fourth side). The Really Right Stuff Lever-Release Clamp review discussed that greatly-favored part of this clamp. I'll just say here that I love these clamps and have them on most of my supports. The panning clamp is also available in a conventional round screw-knob clamp. The comfortably-rounded clamp jaws are laser-engraved in 1mm increments and a built-in 12mm circular "bulls-eye" spirit level makes levelness obvious. Fully unlocked, the panning base is extremely smooth and nicely damped, fluid-like. A large machined pan lock knob adjusting the drum and brake panning base makes adjusting the clamp rotation very easy. It also clears the lever release in any position (tight engineering there). Reaching the fully locked state requires only light pressure on the locking knob and when locked, the clamp does not move. Rotation at partially locked settings remains very smooth in the full 360°. Also making this product an excellent choice is Really Right Stuff's excellent customer service. RRS reps promptly answer the phone and the company stands behind their products. Of course, RRS products are built so well that customer service is not often needed. 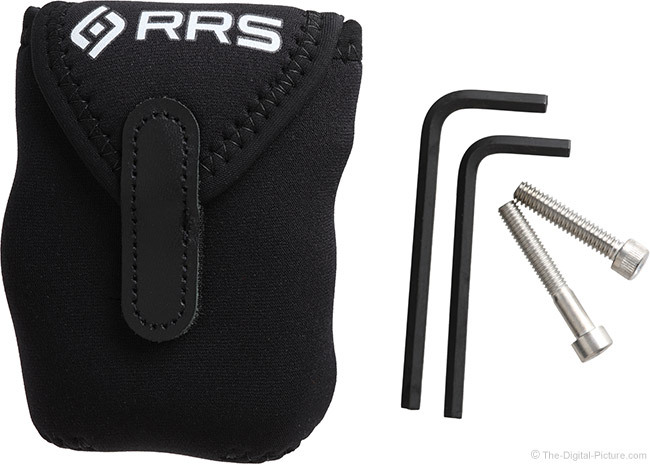 The RRS panning clamp comes packed in its own OP/TECH neoprene protective pouch. The pouch will nicely protect the panning clamp and will also protect your other gear from the clamp. It doesn't take much room to store this clamp, but it adds a small lens worth of weight to a pack. It is a high quality, precisely-constructed product and this combination generally equates to a higher price tag. 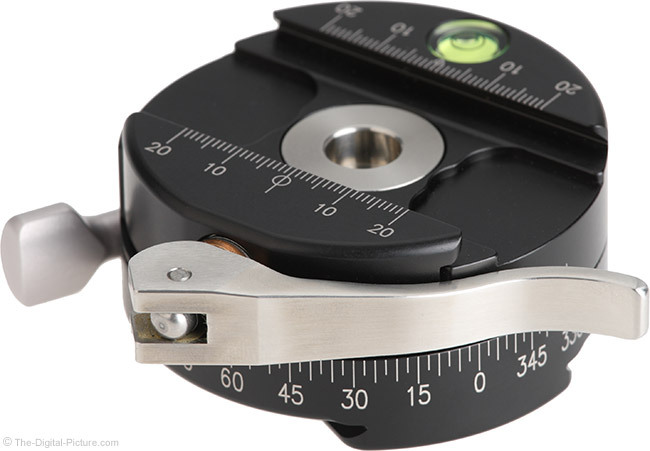 While the Really Right Stuff PC-LR Round Panning Clamp is normal in that regard, it begins to appear a better value when compared to leveling bases. Longevity can make a product a good value and I would expect a properly cared-for RRS panning clamp to last a lifetime. 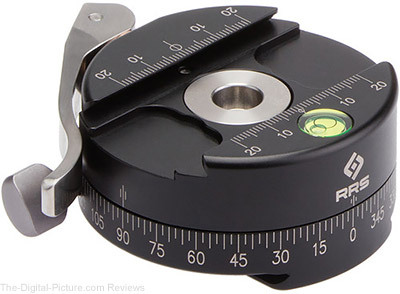 The reviewed RRS PC-LR Round Panning Clamp was purchased online/retail. A panning clamp is somewhat of a specialty accessory and not all kits need one. But, this accessory is a very useful one in certain scenarios and when those are encountered, you will be happy to have this option available to you. When you do need a panning clamp, you are going to be really happy you chose this one. The PC-LR Round Panning Clamp has the excellent design and construction you have come to love Really Right Stuff for. It is another great RRS product.